This will probably be my last post of 2013, and I promise not to bore you with too much philosophical rambling! It’s more just a random assortment of thoughts that have passed through my mind of late. Anyway, I used the coupon to pick up the “grilled” flavor, and decided to prepare it by just lightly sauteeing and then adding to whole wheat bread with a quarter of an avocado and a dab of vegan mayo. The appearance of the product is eerily similar to chicken strips. I personally found the smell and taste, however, to be very similar to other meat analogues I have tried. I know that Beyond Meat has been touted as a breakthrough product for meat-free eating, and I think it is a step in the right direction (especially texture-wise), but you’re not going to fool any omnivores with this one. Still, the sandwich pictured above was REALLY tasty and satisfying, particularly once I busted out some chipotle BBQ sauce for dipping. The sauce took it up about 7 or 8 notches. Verdict: I’d eat this again, but only sporadically. I’m not a big New Year’s person. Never have been. This was actually a little bit of an issue when I was an undergrad at NYU, because each year I’d inevitably face pressure to spend the holiday in Times Square (which I can confidently state is the thing I’d like to do least in the world)! I’ve long felt that there’s just too much hype around the holiday and finding the “perfect” plans to ring in the new year. All I really ever want to do on a given year is be safe indoors (read: WARM. And off the roads!) with my loved ones. I’m not really that into resolutions either. Most of the stuff I could “resolve” to do on January 1 (lose weight, eat healthier, blah blah blah) is stuff I generally strive for all year long. That said, I think it’s important to use the inception of a new year as an opportunity to take stock of your life, where it has gone in the past year, and where you’d like to see it go in the coming year. It’s okay to give yourself short-term goals that aren’t necessarily giant “resolutions” but will still improve your overall situation. For example, one short-term goal I have for the next month or two is to do a pantry clean-out. H and I have accumulated a plethora of stuff in the freezer and cabinets that I would like very much to work through before buying more groceries. So while it is something I’ll be doing to kick off the new year, it isn’t really a resolution. Rather, it’s part of my overall desire to have less clutter and to make do with less in my life. I find that as I get older, it gets harder to define the stages of my life. For most of us, our early lives are measured by the school year schedule. I was on that track up until age 26, when I graduated law school. I was able to project what would happen in an upcoming year of my life and it was easy to have a goal in mind (e.g., graduate or pass the bar). More recently, however, I’ve realized that I have to take ownership of my own life and not let it just pass me by while I’m waiting for something to happen. I’m going to turn 30 in the new year. It’s about time that I define what makes me happy and actively pursue those things. This blog is a perfect example. In 2013, I became much more active in publishing posts as well as being a presence in the community by reading and commenting on other people’s blogs (in fact, I spend considerably more time each week reading other blogs than I do writing my own!). 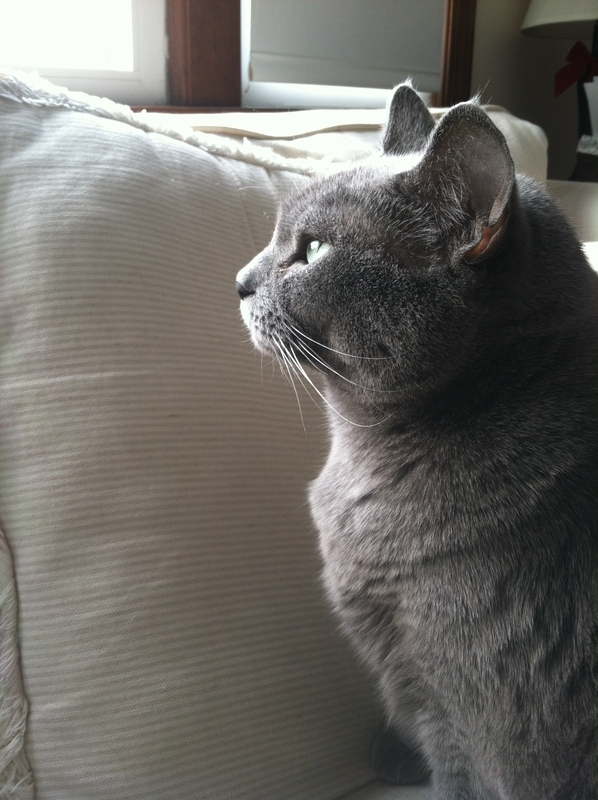 The impetus for my increased activity was the simple realization that blogging brings me joy. This past year, rather than feel constricted by subject matter, I learned that I can write about whatever I want to. I’ve allowed the blog to follow the natural arc of my life and in turn it has become easier and more rewarding to publish posts. The blog is a small representation of the greater lesson I’ve learned this year, which is that the amount of effort you are willing to put into something is directly proportional to how much you will get out of it. The things that are worth having in your life (family relationships, marriage, etc.) are worth working for, and you will get only as much as you give. I wish you all a very happy, healthy New Year, where all of your wishes and resolutions come to be! Hello hello! I hope everyone had a marvelous holiday and/or day off, and that you’re gearing up for a fun weekend as well. And if you’re just rolling through a whole week off, more power to you! 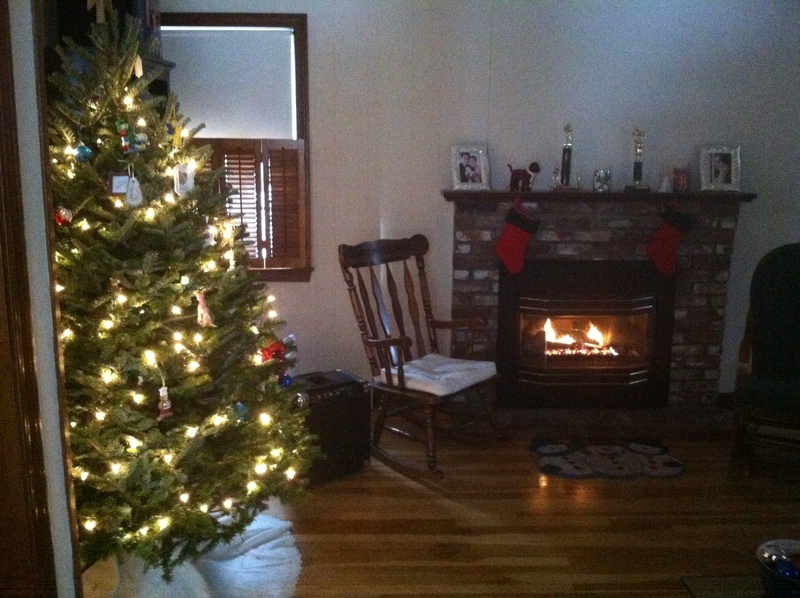 As I explained earlier in the week, H and I observed Christmas last weekend with his family. So for the actual holiday, we decided to keep it low key. My plan was to take a half day on Tuesday to do some baking, cleaning, and last-minute gift wrapping, and then go out to dinner with H. This plan was quickly foiled, however, when my car broke down in a random parking lot. This set me back about four hours and, as you might imagine, several hundred dollars. 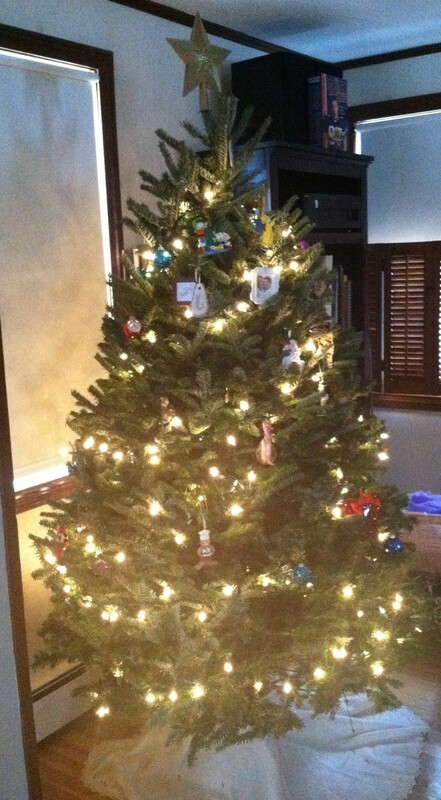 No baking, cleaning, or gift wrapping took place. So Humbug: 1; Christmas: 0. 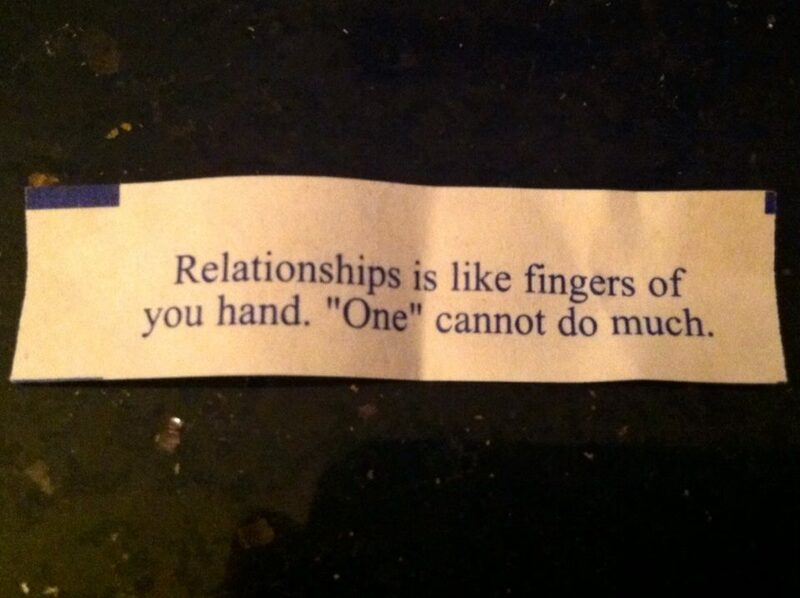 But I did end up having a wonderful evening with my husband at our favorite local Chinese restaurant. Christmas cheer restored! Humbug: 1; Christmas: 1. Exactly what I wanted–my hubby listens! Humbug: 1; Christmas: 2. Things are looking up! 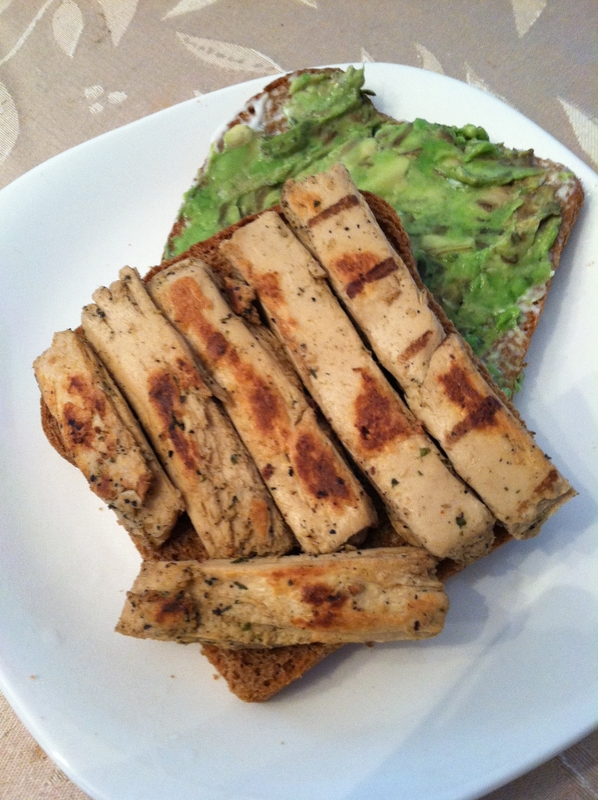 I then had a quick breakfast of tofu bacon on whole wheat toast before going to mass with H.
So tasty! Never gets old. After mass, I broke out one of my other new Christmas gifts, Just Dance 2014 for the Wii!! 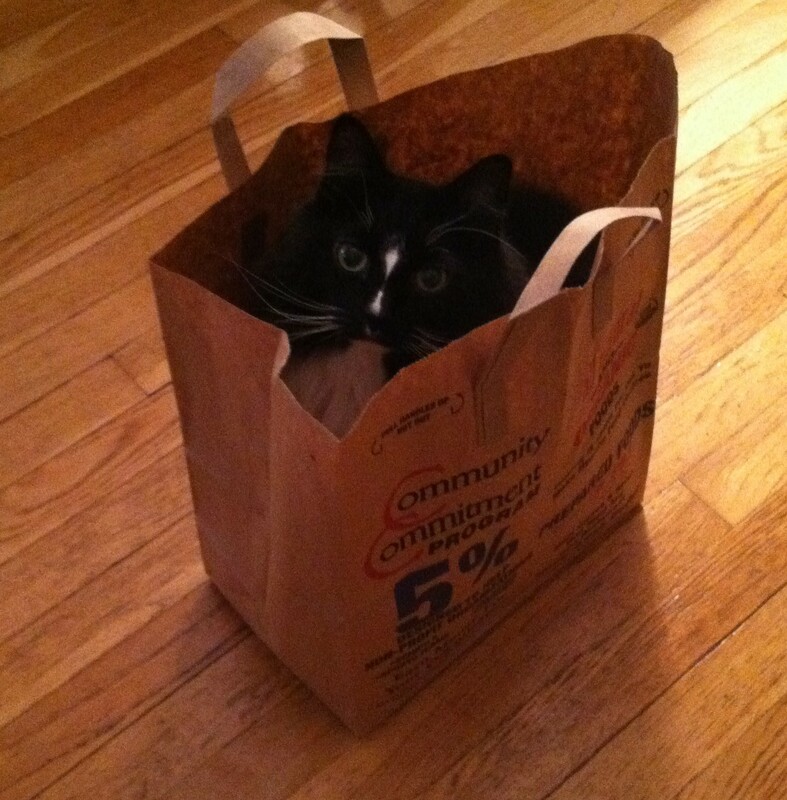 …and promptly threw out my back. Humbug: 2. To be fair, I’m not sure I actually hurt my back by playing the game. It was more that, while playing the game, I suddenly noticed that my back was broken hurting. And then it just kept on hurting. Epilogue: my back still hurts, but I have my car again, and I get to see my family and give them their gifts this weekend, so I can’t complain! What are your weekend plans? Any more Christmas celebrations or are you all done? It’s Christmas Eve, and I don’t know about you, but by now I’ve read about 793 different blog posts with titles like “Top 10 Gifts for Vegans” or “25 DIY Gift Ideas” or “100 Best Cookie Recipes of All Time.” There’s even been a whole book written about edible vegan gifts! I live for stuff like this, and I get a lot of inspiration from others. This year I had kind of a sensory overload though, from the sheer volume of beautiful and thoughtful ideas I came across. In the end, I decided to just keep it utterly simple when it came to my own gifting. That is how these Holiday Candy Cups were born. The flavor variations are endless, but the pictures below show my Toasted Almond, Mint Chocolate Cookie, Sweet and Salty, and Coconut varieties. I first made these candies for our holiday party last weekend, and then made some more to pack into adorable little tins to give to coworkers. 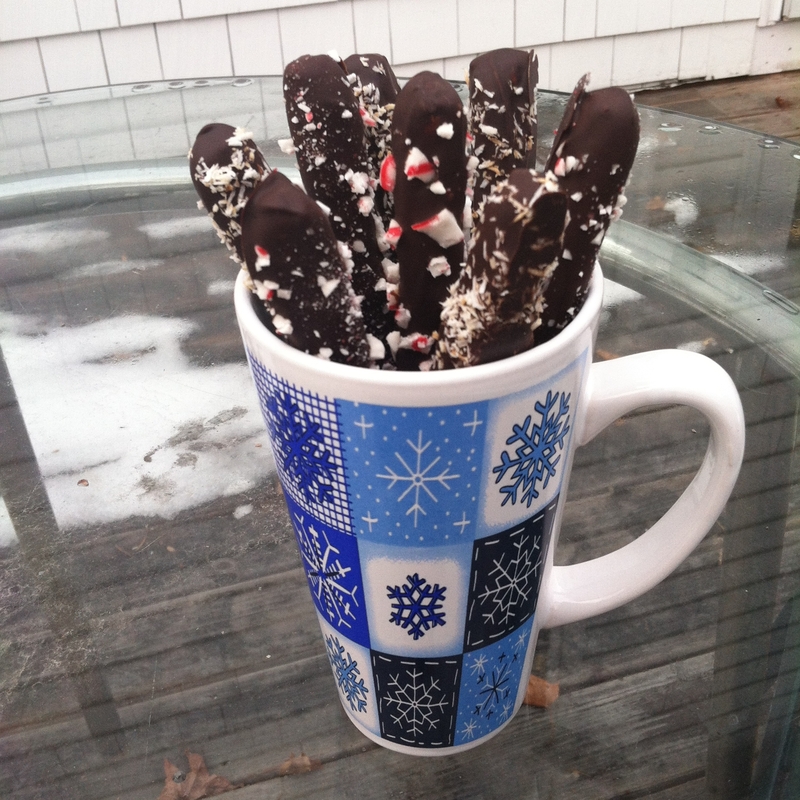 As I mentioned yesterday, I also decided to create some more chocolatey goodness in the form of Chocolate Covered Pretzel Rods with assorted toppings. You can obviously be as creative as you like with the toppings on these. I ended up going with half toasted coconut and half crushed candy canes. I wanted to do some with a peanut butter drizzle but ended up being a bit too pinched for time. Maybe next year! The pretzels are really yummy (I know because I had, um, the broken ones), and I think the gift came out looking pretty and festive too! Like most people my age that I know, I don’t have a ton of cash to throw around on gifts. It can be hard enough to buy for your immediate family and closest friends, but I find the difficulty is compounded when trying to factor in people from work, extended family, neighbors, etc. Often times these are people you don’t even know that well. In those situations, edible and other handmade gifts really are an economical way to spread holiday cheer a little further beyond your immediate circle! 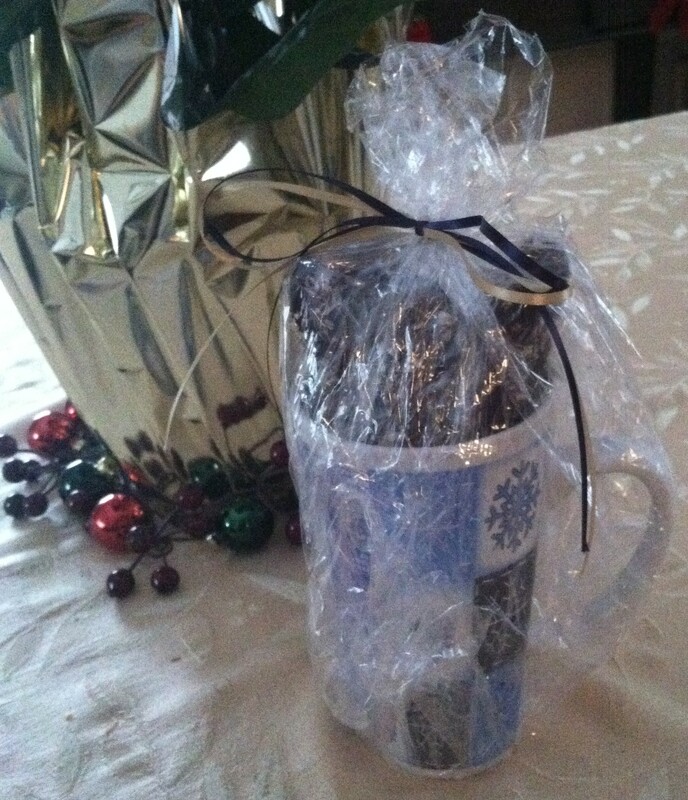 Case in point: the mugs in which I packed the pretzels cost 80 cents apiece at my craft store. EIGHTY CENTS ya’ll. And they were not junky; they were clean, sturdy, and dare I say attractive. At a price like that, I can afford to give a gift to all of my coworkers, our mail carrier, and my favorite bartender rabbi too! Plus, it’s a pretty safe bet that each of those people (assuming of course that he or she is a human) likes candies and cookies. Oh also, the chocolate that I used for the pretzels came from Trader Joe’s. It is good quality, vegan dark chocolate, and it comes in a 1-lb. bar that costs $4.99. You really can’t do better than that. Whether you celebrate Christmas or not, I am sending each and every one of you my warmest wishes at this festive time of year. Happy Holidays! 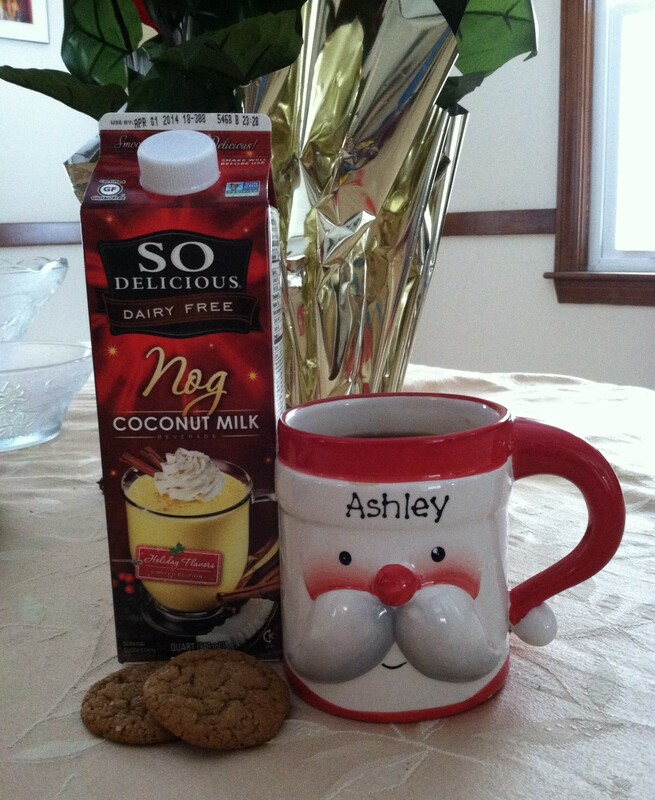 My weekend in a nutshell: so much incredible vegan food, and SO MUCH CHRISTMAS! H and I kicked it off Friday night with a quiet evening in, with a nice bottle of wine and the movie White Christmas. This was the Nutty Tofu and it was SO GOOD. 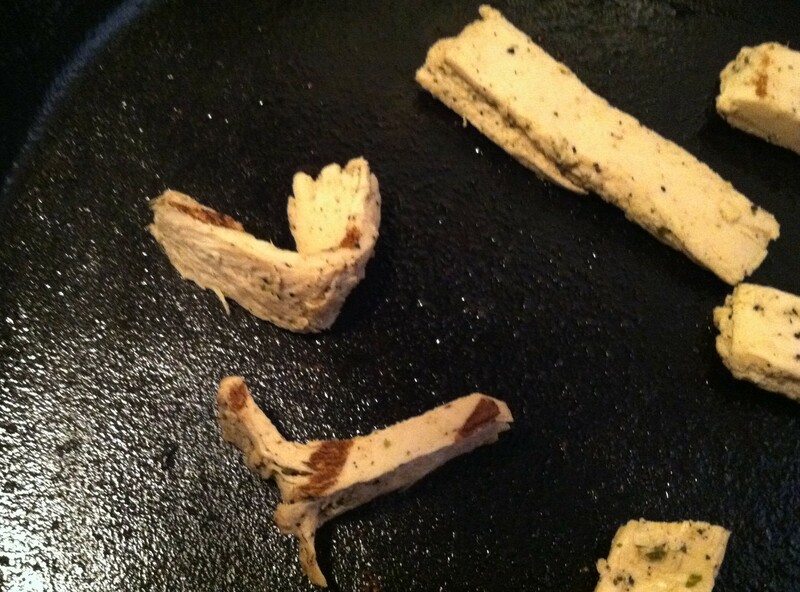 The texture of the tofu was absolutely spot-on and the contrast with the nutty crust just made it so much fun to eat. I really, really enjoyed this. If you follow me on Twitter, you already know that on Saturday morning I treated myself to a very indulgent holiday-themed breakfast! 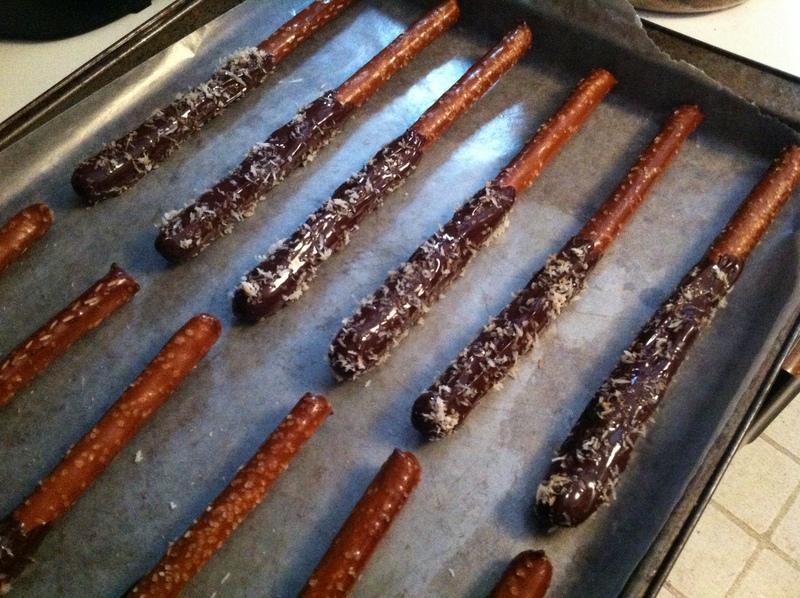 Chocolate-covered pretzel rods with toasted coconut sprinkled over them. 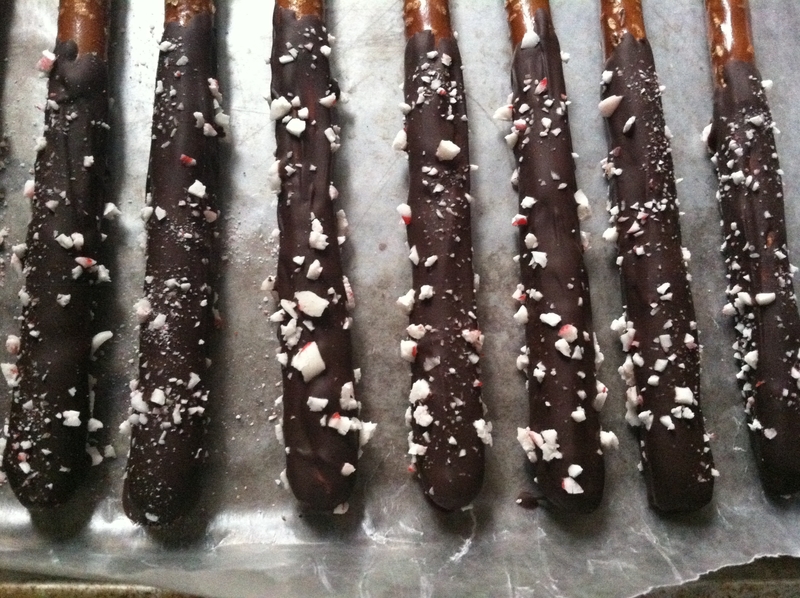 I’m going to do some with crushed candy canes and some with crushed pistachios too! I’ll post a picture of the final product when it’s ready for gifting. 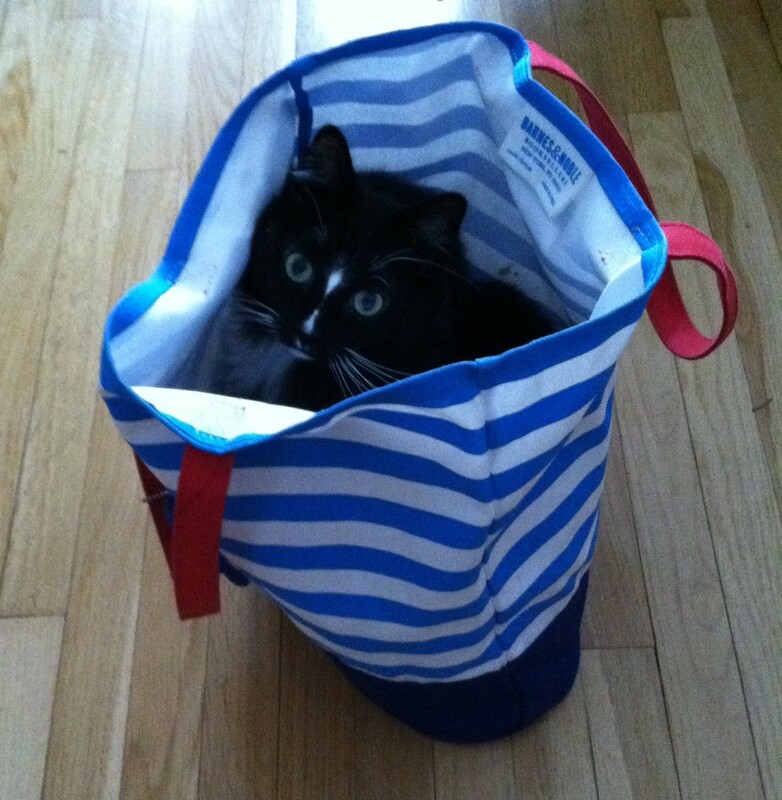 I think he just really loves the expression about letting the cat out of the bag and never tires of it. Then on Sunday, H and I celebrated Christmas with his family. We did it early this year because not all of us will be able to be together on Wednesday. 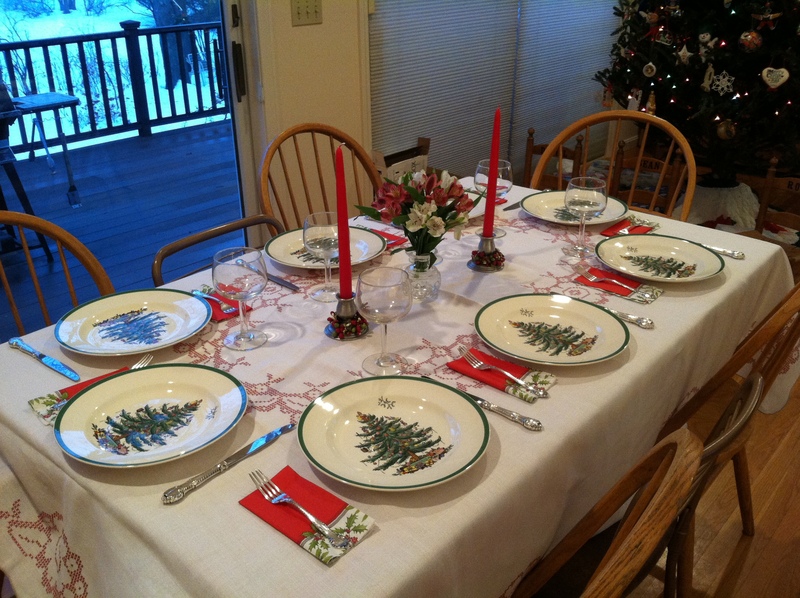 Wasn’t it a beautiful holiday table? It really felt like Christmas Day! We did breakfast and presents in the morning, then family dinner in the evening. 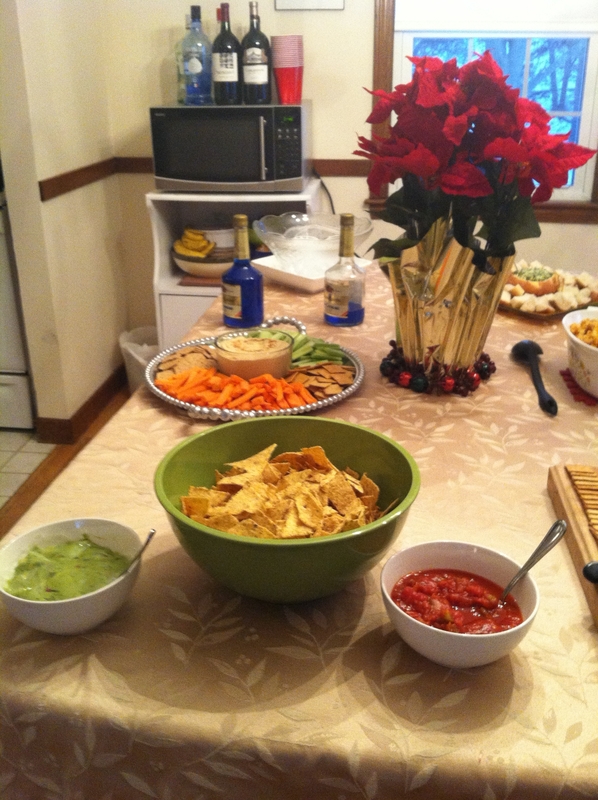 For appetizers, it was requested that I bring my homemade hummus and I was happy to oblige! I even dressed this one up in festive red, green, and white (smoked paprika, za’atar, and pine nuts!). 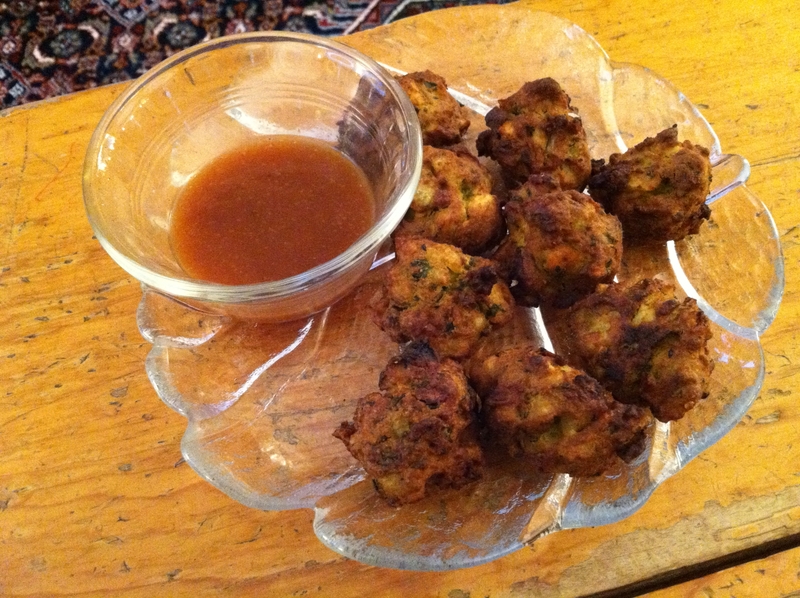 My mother-in-law had also picked up these veggie pakoras with sweet and sour dipping sauce for an appetizer. They were great! 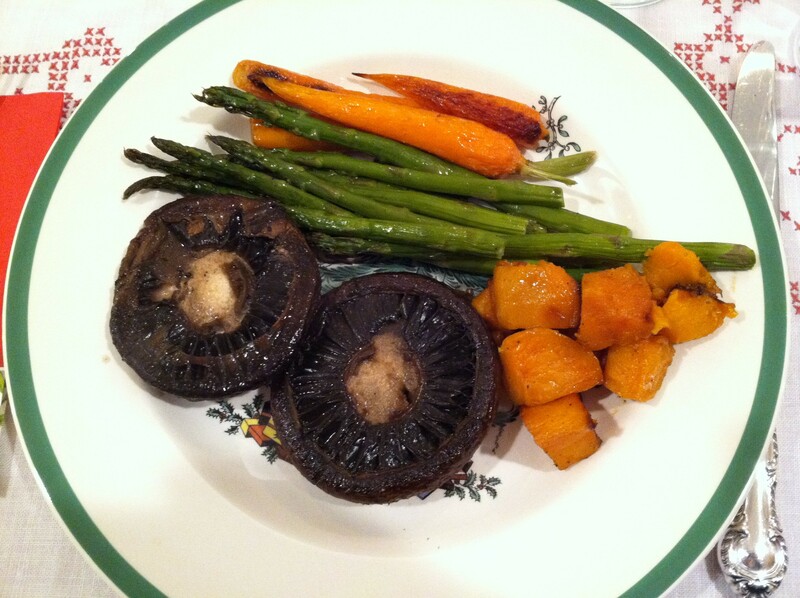 Then for the main course, I enjoyed roasted portabellos, maple sweet potatoes, asparagus, and roasted carrots. 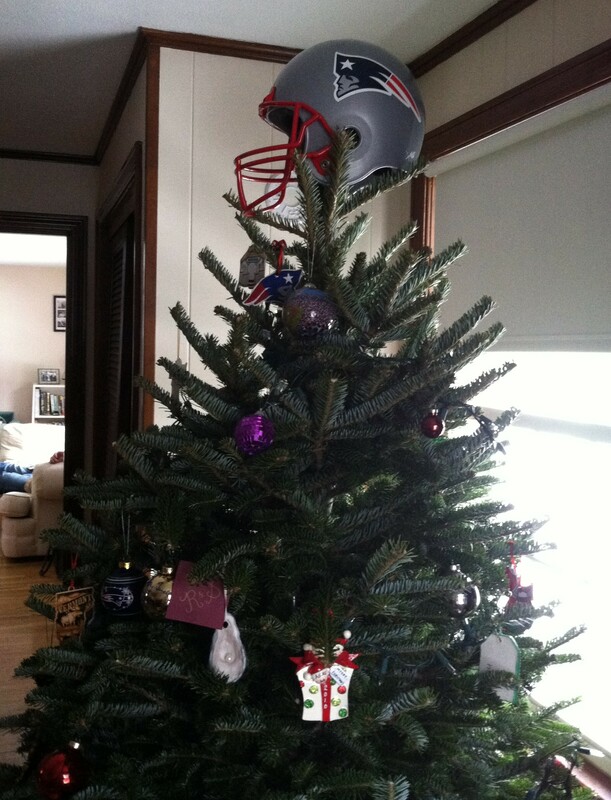 And after dinner, I got the gift I wanted most–a Patriots victory over the Ravens. Sidenote: I loathe and despise the Ravens. Our “fake” Christmas felt really real, so it’s kind of funny to think that tomorrow and Wednesday are the actual holiday. I still need to put in a little more time in the kitchen (finishing the neighbor gifts mostly, but also I want to bake something fun [maybe cinnamon rolls??] for Christmas morning). Overall I am ready to just unplug, relax, and enjoy the day! Giveaway Winner and Dragon’s Loyalty Award! Congrats, girl! I will be emailing you with further details. 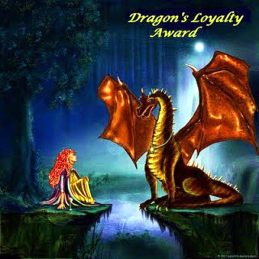 Speaking of Laura (and by total coincidence, I swear), I am honored to have been nominated on her blog This is Thirty for the Dragon’s Loyalty Award! The award is for the loyal fan/commenter, whether the recipient is a fellow blogger or just someone who follows and comments regularly. One of my favorite things about blogging is the community of wonderful people that I’ve been introduced to. I follow several dozen blogs and look forward to reading them every single day. It is truly amazing to be able to connect with people all over the world, most or all of whom I will never meet in person, but whose personalities and unique voices have nonetheless become so familiar to me. Giving and receiving comments is one of the many ways that I participate in this community. Every single time a new comment pops up on my blog, it puts a smile on my face, and I try to pay it forward by leaving as many comments as possible on other blogs too. Anyway, getting this award from Laura means a lot! 2) Acknowledge that blogger on your blog and link back (duh!). 3) Share 7 things other bloggers may not know about you. 4) Nominate up to 15 bloggers for Dragon’s Loyalty Award, provide a link to their blogs in your post, and notify them on their blogs. 5) Copy and paste the award somewhere on your blog. 1. 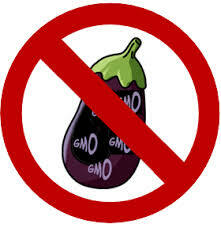 I am allergic to eggplant (GMO or otherwise), a sad fate for a vegetarian. 2. Growing up, I was really into music and art. I was a singer, played violin, clarinet, and piano, and my dream was to become a Disney animator. Now I’m a lawyer, which in many ways is the opposite of a creative profession. 3. 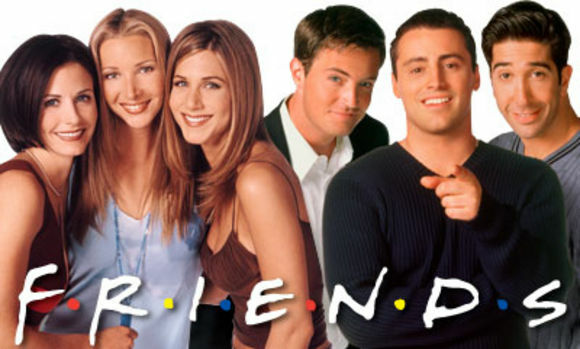 I own all 10 seasons of Friends on DVD and have seen every episode multiple times. Last year I got H into it as well and we watched the whole series together from start to finish. 4. While we’re on the subject of H…that letter actually stands for the first letter of his last name, not his first (and it doesn’t stand for “Husband” either)! This is because when we first started dating (and when I first talked about him on the blog), we used to refer to each other by our last names 🙂 Rather than change it on the blog after I finally learned his first name, I’ve elected to keep him as H.
H and me, about two weeks after we started dating! I used to be so cute. 5. And speaking of H’s last name, it’s my last name now too! But obviously I have continued to use my maiden name for blogging purposes. I was way too proud of “A. Cook in the Making” to give it up. 6. I am a huge Harry Potter nerd. 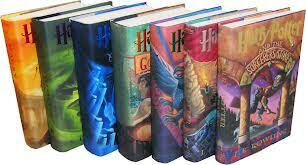 I have read each book several dozen times (the first three in Spanish, too) and own the British version of the series. My sister and I used to dress up and go to the midnight book release parties, and I was one of the people on the message boards looking for emotional support after finishing Half-Blood Prince for the first time. I also attended the midnight release showing of all eight films. 7. 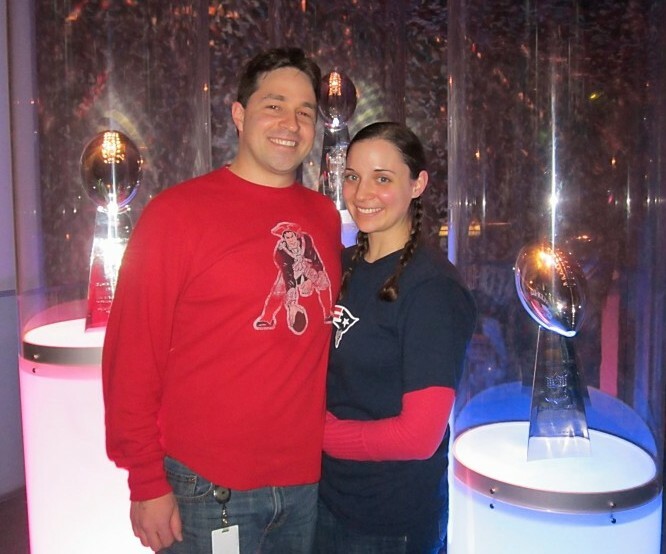 Despite growing up completely disinterested in professional sports, I now (thanks to H) follow all of the Boston teams, and am particularly devoted to (and frankly, obsessed with) the Patriots. P.S. – Only one more week until Christmas!!! Are you ready to go or do you still have tons to do?! I am somewhere in between. Despite all of the craptastic snow, H and I went ahead with our holiday party on Saturday. Although a lot of people had to bail, we still ended up with a crowd of about 20, so I’m glad that we kept the party on! Actually, I am proud to report that I succeeded in my goal of not being a complete psycho with the menu this time around. Of course, there was still plenty of work to be done, but I’m getting pretty adept at making a week long, day-by-day to-do list leading up to parties, and it makes it so much easier to manage my time efficiently. 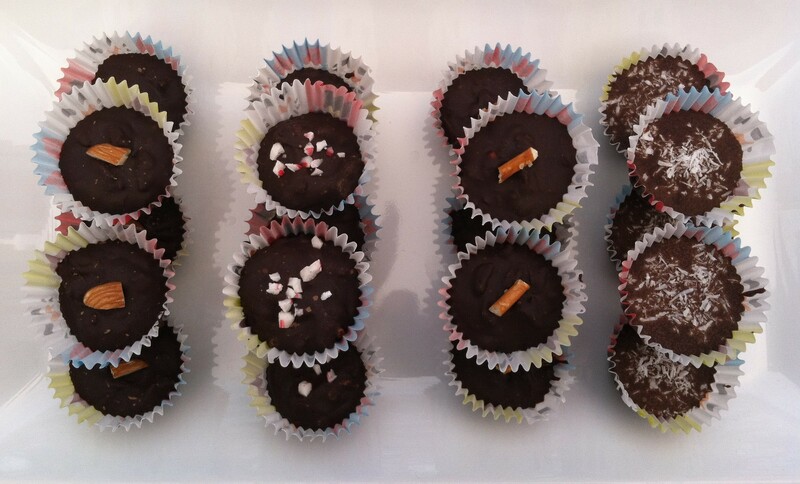 Here are some pics of the festive eats! 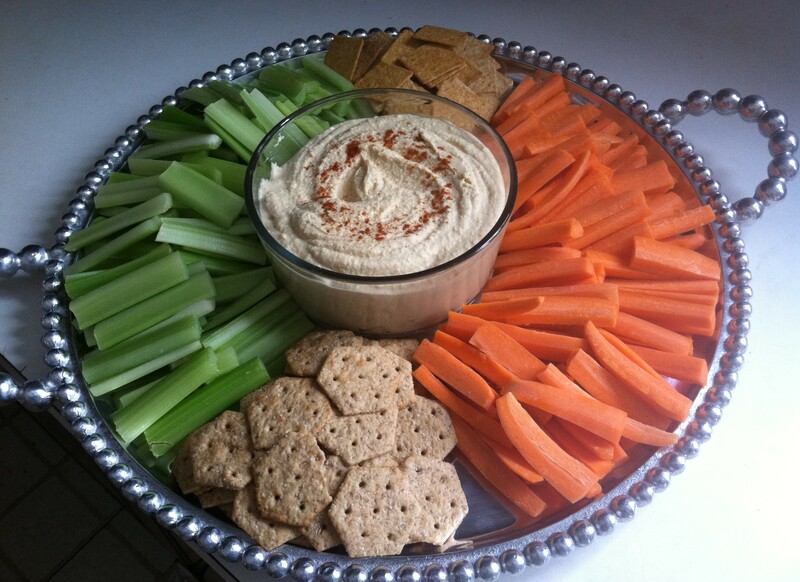 Homemade hummus with veggies and crackers. Classic. 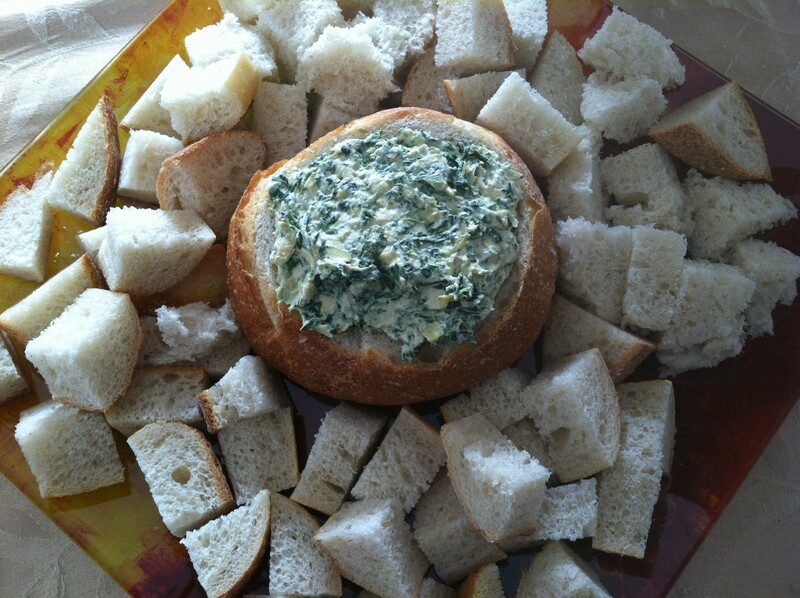 Becky’s Spinach Artichoke Dip with Garlic Cashew Cream (because I will never again host a party which doesn’t include this magical app). 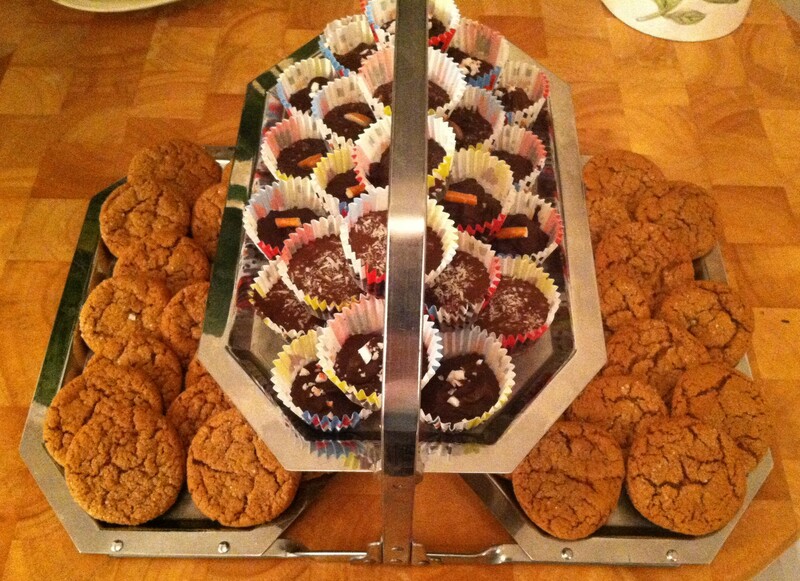 This got demolished by the guests and as usual, everyone was surprised to find out it contained no dairy. And of course drinks. So many drinks. In the photo above, you can see the beginnings of the Mazal Tov Cocktail going into the punch bowl. For entrees, I had a chili bar complete with cornbread, although apparently I didn’t take any pictures of that. 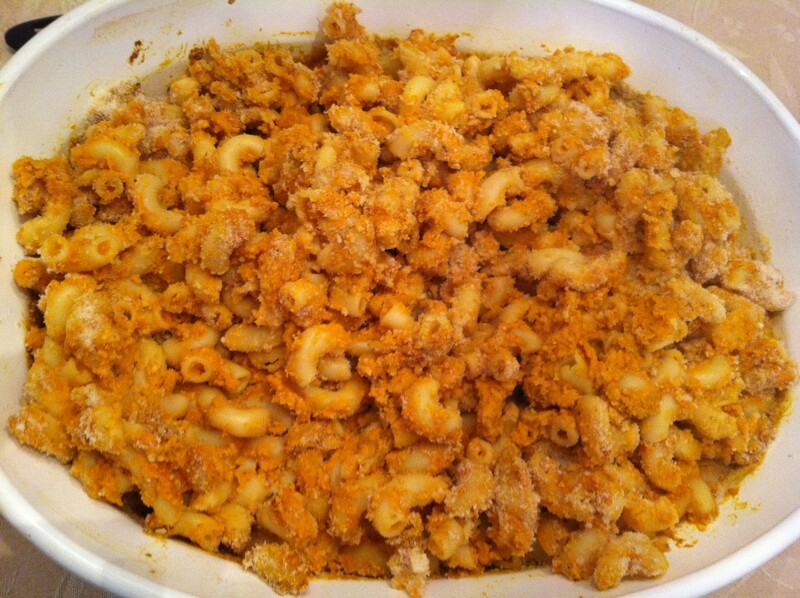 I also did Smoky Pumpkin Mac n Cheese by Jackie of Vegan Yack Attack, which I baked with breadcrumbs on top. I like this recipe but I wouldn’t make it again for a party. It was hard to keep it warm and it seemed to dry out after reheating. Plus, it really benefits from the addition of sriracha, but I didn’t feel comfortable stirring that in because I try to go easy on the spiciness when serving to a mixed crowd, especially one that includes children. There ended up being a lot leftover, which is great for me, because I’ll be eating the tasty leftovers all week (with all the sriracha my little heart desires). 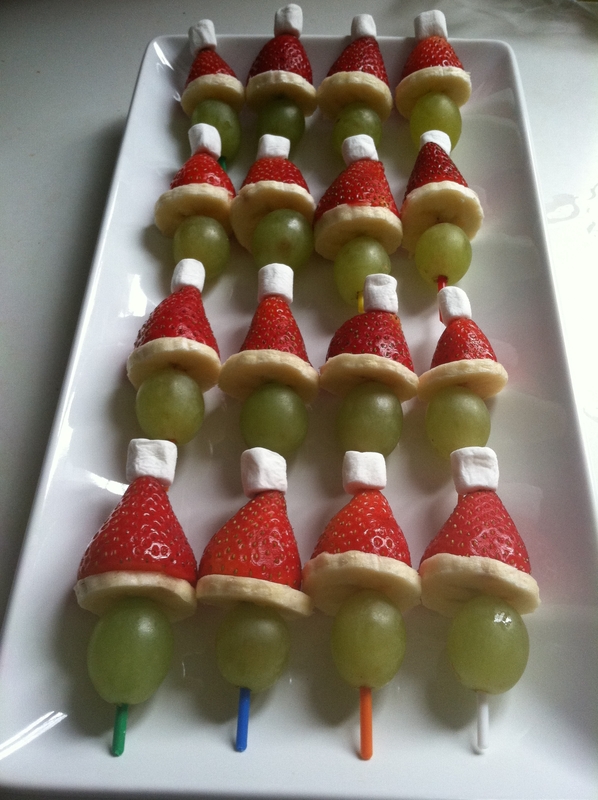 I cannot take any credit for this idea, as I borrowed it from the Interwebs, but I will say that these were delicious as well as super-cute, and the kids at the party particularly loved them. 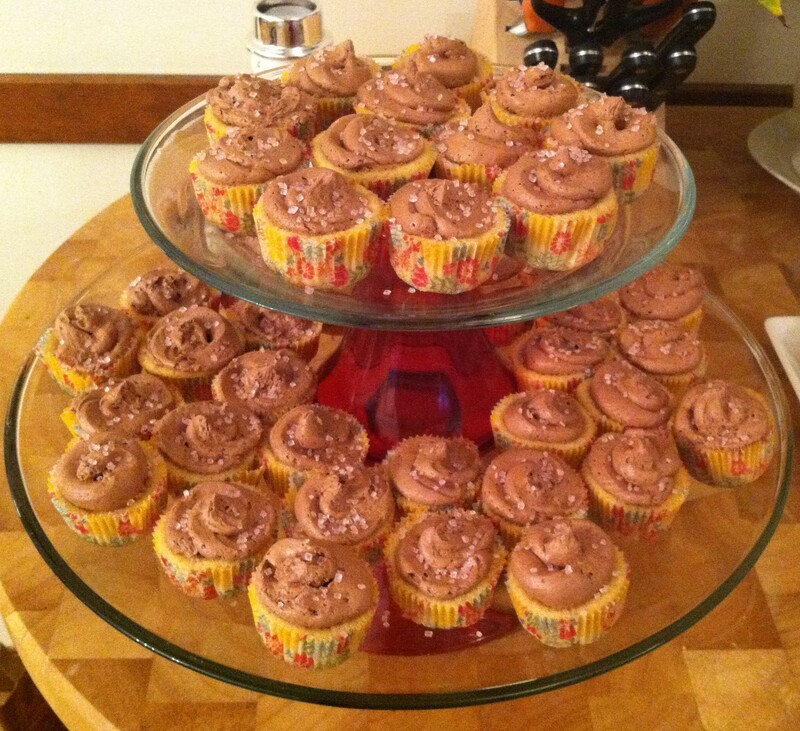 I will definitely be making these again! It’s a good thing he’s pretty. 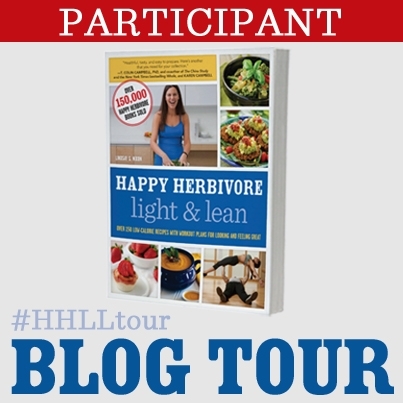 The name Happy Herbivore is probably familiar to most of you. Lindsay S. Nixon, the savvy lady behind the elephant, is a strong proponent of a no-oil, plant-based diet. Her three previous cookbooks (Happy Herbivore Cookbook, Everyday Happy Herbivore, and Happy Herbivore Abroad) have been extremely successful, and she also provides a weekly meal plan service designed to help people lose weight and stave off disease with a diet comprised of unprocessed, whole foods. Her newest venture, Happy Herbivore Light & Lean, provides over 150 plant-based recipes, all of which use no oil and are 350 calories or less. A former personal trainer, she has also included a whole section on fitness! While I personally do not follow a no-oil diet, I am always looking for ways to eat healthier and incorporate more whole plant foods into my daily menu. I have generally found the Happy Herbivore cookbooks and blog to be valuable resources and an inspiration for cleaner eating. 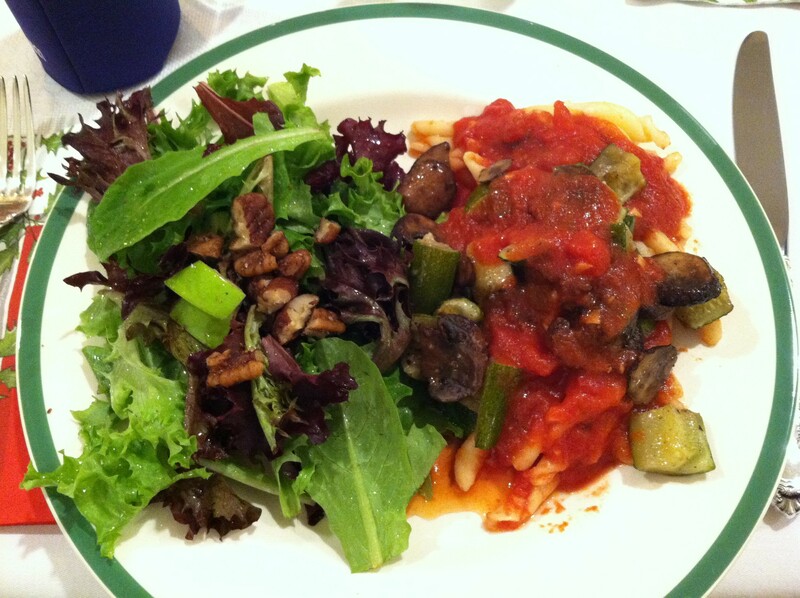 And I have to say, Happy Herbivore Light & Lean may be the best resource yet. For a start, I can pretty much open up the book to any page and be able to make the recipe using stuff I already have in my kitchen. Both the ingredients lists and the recipe instructions are short, sensible, and straightforward. This is a huge plus for me on weeknights when I don’t have a lot of time to shop or cook. 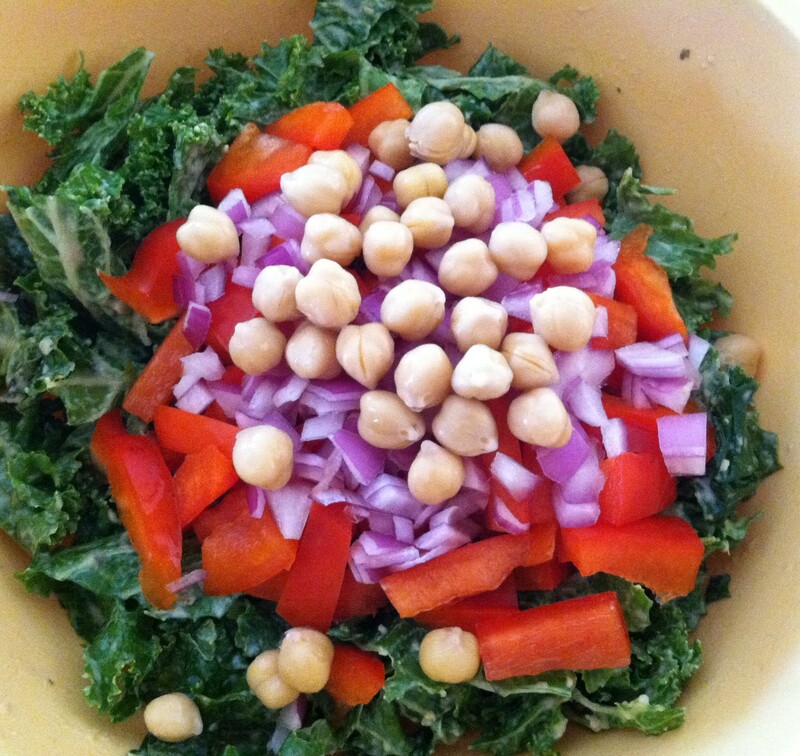 Creamy Kale Salad (p. 180). So normally when a cookbook has a salad recipe I’m like, “Why do I need this?” But this one caught my eye because it employs a new-to-me technique of massaging hummus into the kale. The result is a giant (like, really big) bowl of totally palatable raw kale goodness. I’ve made this for dinner at least 5 times since I got the book. In addition to the simplicity of the recipes, I feel like this book is a money saver as well. No fancy ingredients or equipment are required. There is even an entire section entitled “Do-It-Yourself” which includes instructions for making things like ketchup, vegan worcestershire sauce, and no-chicken broth powder from things you probably already have in your kitchen. Overall, I would recommend this book to anyone who wants to have quick, healthy, no-fuss recipes (that are also perfectly tasty) at their fingertips. A. Cook: This is your fourth cookbook! How do you stay inspired to create new recipes? How do you avoid repetition? HH: Sometimes I’ll pick up an ingredient and figure out a way to make something with it. Other times I’ll see something and want to recreate it at home. For example, when I was in Ireland I saw signs all over the place for Guiness stew or Irish stew. Of course it wasn’t vegan, or vegetarian, so I waited until I got home, learned about the traditional recipe, then made a plant-based version… and now it’s in Light & Lean! I treat writing books like a job — 8-10 hours in a kitchen making it work! A. Cook: You advocate a plant-based, oil-free diet and all of your cookbooks fit into this paradigm. How is HH L&L different from the others in terms of promoting weightloss? HH: I was inspired by my meal plans (http://www.getmealplans.com). While the recipes in Light & Lean are different than the recipes my clients get each week with the meal plans, my approach to cooking (feeling full on fewer calories; making it ultra healthy but still delicious) was my focus with this cookbook. I was also a personal trainer some years ago, and it was nice to be able to bring that experience into this book. It felt like a good fit for the theme. A. Cook: How has your cooking style evolved since you first published a cookbook? HH: With each book I’ve taken feedback (good and bad) to heart and made adjustments based on that and what my fans want. It’s been an evolution together. A. Cook: What were the main factors you considered when designing the workouts in this book? HH: I wanted workouts that anyone could do — that were flexible to all skill levels, that could be done at home, in just a few minutes, and without pricey equipment. Mission accomplished! A. Cook: Does your minimalist lifestyle play a role in the book? If so, how? HH: I think being a minimalist falls into every aspect of my life, but I wouldn’t say I intentionally included it. Sloppy joes—or, as my family calls them, “wimpies”—were one of my favorite childhood foods before I became a vegetarian. 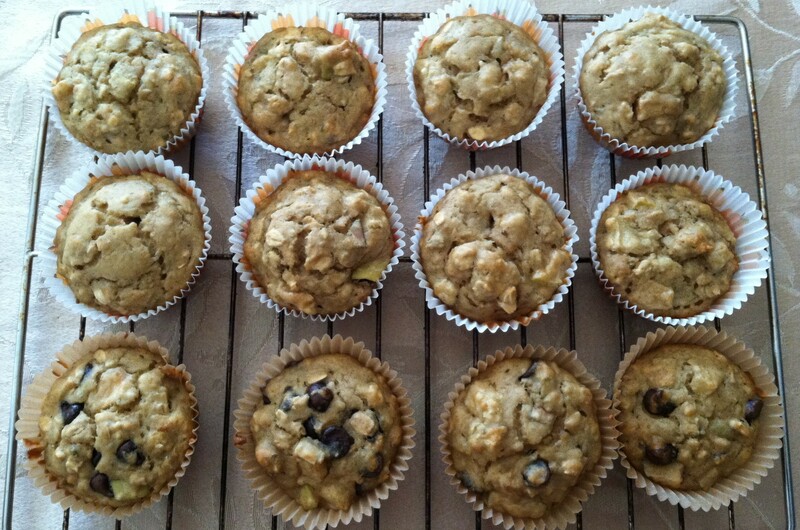 I’ve never had much success mimicking my mom’s recipe (vegan or not—I swear she’s holding back a secret ingredient! ), so I decided to take a totally new approach and use lentils. 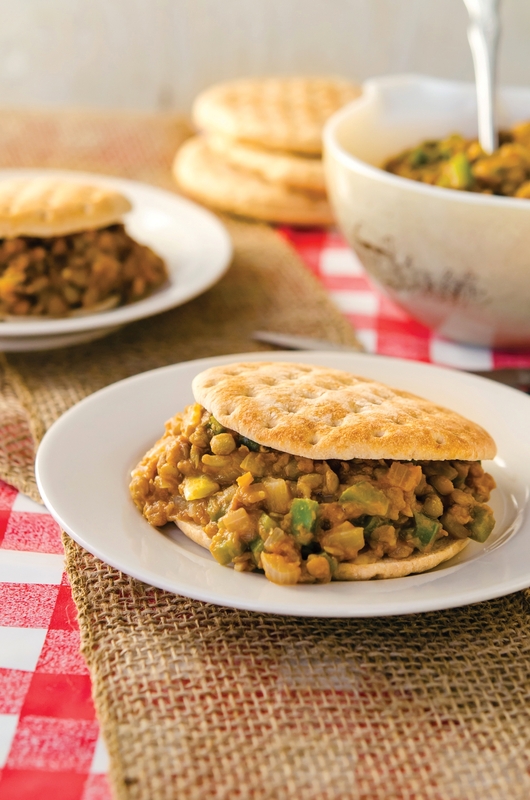 It’s not Mom’s meatloaf—er, sloppy joes—but this recipe is deliciously different, quite filling, and very easy to make! For years my lunchbox revolved around a sandwich. 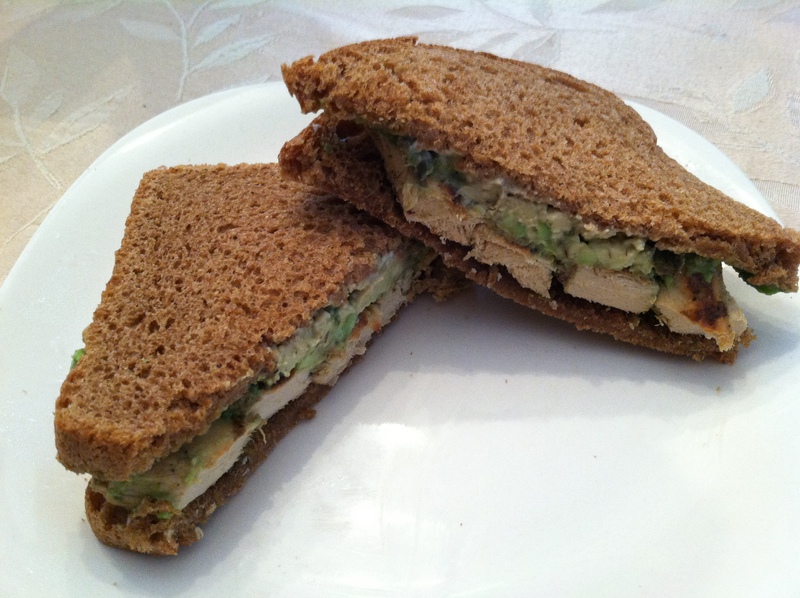 Although I’ve become more creative with my lunches over the past few plant based years, I still love going back to the classic sandwich with two sides option. Line a large skillet with a thin layer of vegetable broth and saute onion, garlic, and bell peppers until onion is translucent, bell peppers have softened and turned a mellow green, and most of the broth has evaporated. Add remaining ingredients (hot sauce or cayenne as desired, plus a few dashes of smoked paprika) and stir to combine. Warm, stirring occasionally, over low, and then serve. 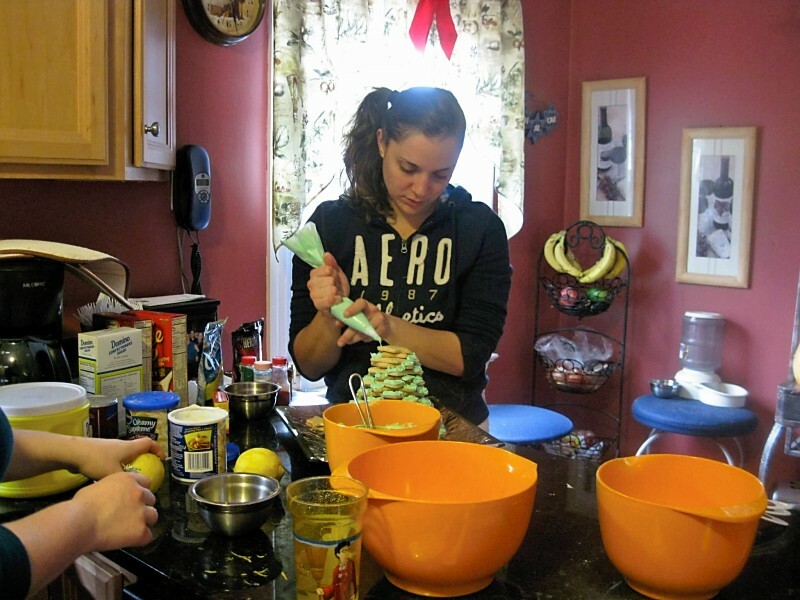 You can watch Lindsay make this recipe in an online cooking class by clicking here. 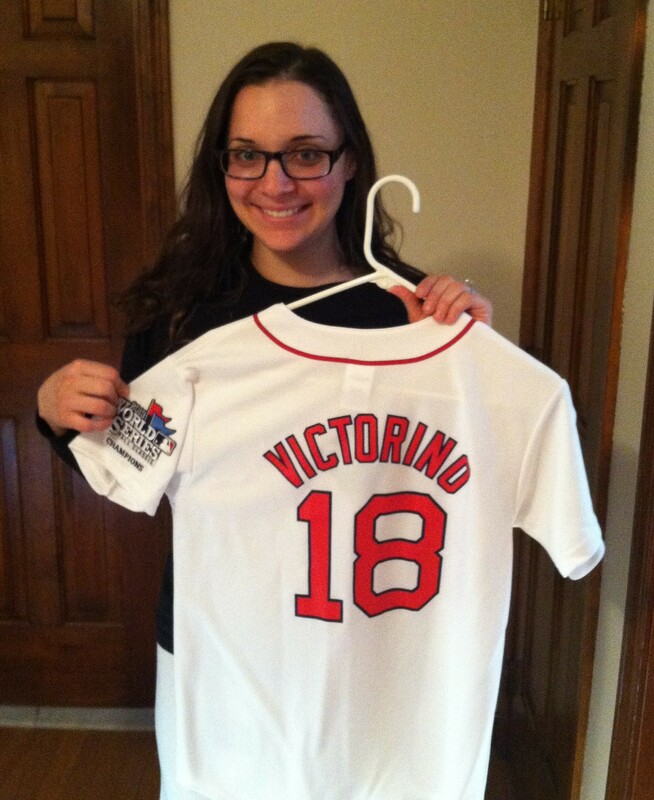 Okay and finally, the giveaway! In honor of Lindsay and her minimalist approach to life, I’m keeping it simple. To enter, simply click over to Amazon, “Look Inside” the table of contents, and leave a comment telling me which recipe sounds the yummiest to you. 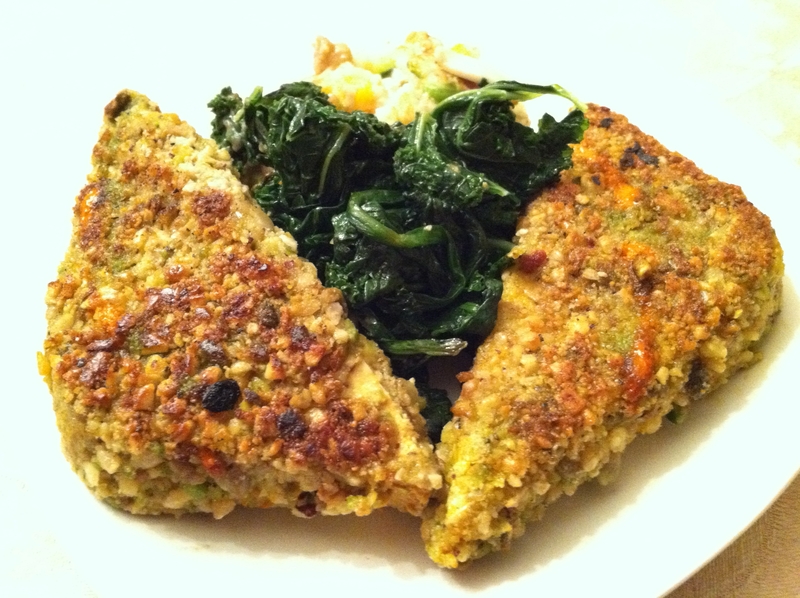 Or, you can leave a comment with your favorite easy, low-cal plant-based dish! This giveaway is open to residents of the U.S. and Canada only, and will close at 11:59:59 p.m. EST on Tuesday, December 17, 2013.